Cheddar and broccoli make for a perfect match. This recipe combines the two for an easy and delicious dish. 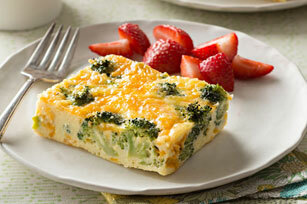 Old cheddar, broccoli, cream cheese and eggs never tasted so good! Enjoy as a brunch crowd pleaser, or with a salad as a part of a simple dinner. Why wait? Bring on the company! Place broccoli in microwaveable 9-inch-square baking dish sprayed with cooking spray. Add water; cover with parchment. Microwave on HIGH 2 min. ; drain. Return broccoli to dish; top with cheddar. Whisk cream cheese spread, eggs and Parmesan until blended; pour over broccoli. Bake 25 min. or until top is golden brown and centre is set. Serve with fresh fruit and whole wheat toast to balance out the meal. Add a pinch of ground nutmeg to egg mixture before pouring over drained microwaved broccoli in baking dish.